Tips are the paper filters of a joint. A tip is made of a small rectangular paper. Buy the tips as small booklets that usually contain 50 tips. Tips are essential for rolling and smoking a joint. It's the paper filter of the joint. At the Dutch-Headshop, there is ample choice in all kinds of tips. 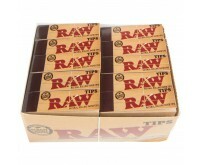 Tips are used as a joint filter. It ensures you can easily smoke the joint, without tobacco of marijuana getting into your mouth. Furthermore, rolling a joint with a well-folded tip is a lot easier. Tips always come in a booklet when ordering, but of course you can also bring a few individual tips in your pocket. The amount of tips per booklet varies per brand. A tip booklet contains at least 30 to 50 tips. There are two different types of tips. Apart from the normal, rectangular tips, there are also conical tips. These tips are a better fit for a joint, because the tip is conical-shaped when you roll it. This makes rolling easier and smoking more pleasant. The folding edge of the tip is very handy for obtaining a W or M-shaped tip quickly and easily. Tips are available in separate booklets and in boxes. You can save money by buying a box, and you will have a nice stock at home. A box contains 25 to 50 tip booklets. The number of tips per box depends on the tips’ brand. The tips in our product range are from a variety of brands. Each brand has its own identity and qualities. All brands, including its features, are listed below. Futurola; made of certified paper. Kulu; colored tips and wider-than-normal tips. Raw; normal and conical tips, no chlorine and chemicals in paper and made with an antique paper machine. Smokers Choice; conical tips, special perforations and made of ecological paper. Avoid your tip stock runs out! Simply order the enough high-quality tips at the Dutch-Headshop.